The aorta is the body’s largest artery (a blood vessel that carries oxygen-rich blood). 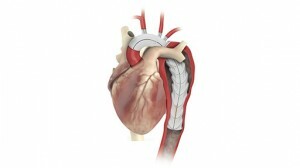 Roughly the diameter of a garden hose, this artery extends from the heart down through the chest and abdominal region, where it divides into a blood vessel that supplies each leg.An aneurysm is a balloon-like bulge in the aortic artery that occurs when the wall of the vessel becomes weakened. Blood pressure forces it to bulge outward, forming something similar to a blister. An aneurysm can often be repaired before it bursts. Surgery involves replacing the weakened section of blood vessel an artificial tube (called a graft). Surgery to repair an aortic aneurysm depends on the size and location of the aneurysm and your overall health. Aortic aneurysms in the upper chest (the ascending aorta) are usually operated on straight away as they can become critical. Aneurysms in the lower chest and the area below your stomach (the descending thoracic and abdominal parts of the aorta) may not be as life threatening. Aneurysms in these locations are monitored for varying periods, depending on their size. If they grow over 4-5 centimetres (almost 2 inches) in diameter (depending on your height and health) or continue to grow fast and/or begin to cause you symptoms, you will be advised to proceed with surgery to stop the aneurysm from bursting. The operation typically requires a hospital stay of 5-7 seven days and is done under general anaesthesia. This means you will be asleep during the procedure. Once the anaesthetic has taken effect, your surgeon will make an incision (traditionally about 25cm long, a mini sternotomy access is not appropriate here) down the middle of your breastbone and open the ribcage to reach the heart. The heart is stopped (using medication) and blood is re-routed to a heart-lung machine. This takes over the pumping action of the heart and lungs, adding oxygen to the blood and maintaining the circulation. Your surgeon will remove the damaged part of the aorta and sew in an appropriately sized plastic tube. If the aneurysm extends up to your head and neck vessels, your temperature will be lowered to 15-27 oC and the blood circulation to your brain will be stopped very briefly. After finishing the aortic replacement, blood is then redirected back to your body and your heart is restarted. The breastbone is re-joined using wires and your chest is closed using dissolvable sutures, stitches or staples. The operation usually takes about 4-8 hours. Thoracic aortic aneurysms are usually diagnosed when patients reach their 6th and 7th decades of life. Aneurysms in patients younger than 40 usually involve the ascending aorta due to weakening of the aortic wall and are associated with connective tissue disorders like the Marfan and Ehler-Danlos syndromes or congenital bicuspid aortic valve. Younger patients may develop aortic aneurysms of the thoracoabdominal aorta following an aortic dissection. Atherosclerosis (thickened artery wall due to build up of fatty materials) is the principal cause of descending aortic aneurysms, while aneurysms of the aortic arch may be due to dissection, atherosclerosis or inflammation. High blood pressure and cigarette smoking are the most important risk factors, although the importance of genetic factors has been increasingly recognized. Approximately 10% of patients may have other family members who have aortic aneurysms. The principal causes of death due to thoracic aneurysmal disease are dissection and rupture. Relative aortic aneurysm size in relation to body surface area may be more important than absolute aortic size in predicting complications. ASI >4.25cm/m2 are at high risk (20-25%/y). Rapid expansion in aortic diameter is also a surgical indication. Aneurysm growth averages 0.07 cm/year in the ascending aorta and 0.19 cm/year in the descending aorta. A growth rate of 1 cm/year or faster is an indication for surgical repair. In patients with family history of aortic dissection or with Loyes-Dietz syndrome (a more severe form of Marfan syndrome), surgery should be considered when they are even smaller than 5.0cm in diameter. Note: patients with symptoms should undergo repair of their aneurysm regardless of size. Acutely symptomatic patients require emergency operation. Bileaflet Aortic Valve disease (the disease where the aortic valve has two instead of three leaflets) is also a heritable disorder, is known to have an increased risk of ascending aortic aneurysm as well. Marfan syndrome and BAV aortic disease share common histopathological findings, including medial degeneration, increased matrix metalloproteinase (MMP) activity, and decreased fibrillin-1 in the aortic wall. Those patients who have BAV should have elective surgical repair of the ascending aorta when it reaches 5.0 cm, similar to Marfan syndrome criteria, because ascending aortas associated with BAV have fast growth rates and tend to dissect and rupture at a young age. Those with indications for elective replacement of a dysfunctional aortic valve, should undergo concomitant repair or replacement of the aortic root or ascending aorta at 4.0 cm. Although aortic diameter is currently the major criterion for timing of elective surgical repair of ascending aortic aneurysms, it is an imperfect predictor of aortic dissection or rupture. For BAV patients, surgical repair should be considered at an even more conservative limit of 4.5 cm when other clues indicate more severe aortic disease, as per attached table. Aortic dissection is a tear in the wall of the aorta that causes blood to flow between the layers of the wall of the aorta and forces these layers apart. Aortic dissection is a medical emergency and can quickly lead to death, even with optimal treatment. If the dissection tears the aorta completely open (through all three layers), massive and rapid blood loss occurs. Aortic dissections resulting in rupture have an 80% mortality rate and 50% of patients die before they even reach the hospital. Aortic dissection is associated with high blood pressure and many connective tissue disorders. It can also be the result of chest trauma. 72 to 80% of individuals diagnosed with an aortic dissection have a previous history of high blood pressure. Note that vasculitis (inflammation of an artery) is rarely associated with aortic dissection. The highest occurrence of aortic dissection is in individuals who are 50 to 70 years old. The incidence is twice as high in males as in females (male-to-female ratio is 2:1). Half of dissections in females before age 40 occur during pregnancy (typically in the 3rd trimester or early postpartum period). A bicuspid aortic valve (a type of congenital heart disease involving the aortic valve) is found in 7-14% of individuals who have an aortic dissection. These individuals are prone to dissection in the ascending aorta. The risk of dissection in individuals with bicuspid aortic valve is not associated with the amount of valve disease (stenosis). Marfan syndrome is found in 5-9% of individuals who suffer from aortic dissection. Marfan syndrome is a genetic disorder of connective tissue. It is associated with aneurysms of the aorta as well as proximal aortic dissections and is likely to occur in younger individuals. Turner syndrome is also a genetic disorder which increases the risk of aortic dissection due to aortic root dilatation. Aortic dissection due to chest trauma can be divided into two groups based on cause: blunt chest trauma (commonly seen in car accidents) or complications resulting from medical treatment. Complications include trauma during cardiac catheterization or due to an intra-aortic balloon pump. 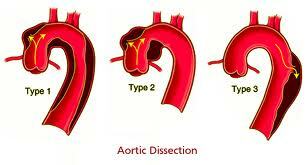 Aortic dissection may also occur as a late onset result of cardiac surgery. 18% of individuals who present with an acute aortic dissection have a history of open heart surgery. The acute Type A dissection represents a cardiac emergency. This type of disease requires an immediate replacement of the dissected part of the thoracic aorta (with inclusion of the “torn” part of aorta where the “hole” is). Usually, the ascending part of the thoracic aorta is replaced by a plastic tube, while the aortic valve (which is frequently leaking as a result) is usually repaired at the same time. Part of the remaining native thoracic aorta, despite been dissected, remains untouched and is treated at a later stage. sive surgery is required and the need for extensive replacement of larger parts of the thoracic aorta is explored. Endovascular means that surgery is performed inside your aorta using long, thin tubes called catheters without having to open the chest. A small incision is made at the top of the leg (groin) and a catheter is passed into your femoral artery and up to the site of the aortic aneurysm. 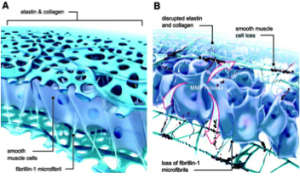 It is then used to guide and deliver a stent-graft to the effected area. 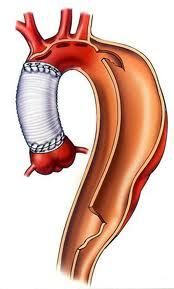 The stent-graft is deployed in the diseased segment of the aorta and “relines” the aorta like a sleeve. The endovascular stent-graft is a fabric tube supported by metal wire stents (also called a scaffold) that reinforces the weakened aneurysmal area. By sealing the area tightly above and below the aortic aneurysm, the graft allows blood to pass through it without pushing on the aneurysm. Endovascular repair of thoracic aneurysms is generally less painful and has a lower risk of complications than traditional surgery because the incisions are smaller. Endovascular aortic aneurysm procedures also allow you to leave the hospital sooner and recover more quickly. You may be eligible for endovascular stent grafting if your thoracic aneurysm has not ruptured and the aneurysm is greater than 5 cm in size. However, not all patients are a candidate for this procedure any potential surgery should be discussed with your cardiac surgeon. Current indications for surgical repair in patients with bicuspid aortic valve and ascending aortic ectasia. Etz CD, Misfeld M, Borger MA, Luehr M, Strotdrees E, Mohr FW. Cardiol Res Pract. 2012;2012:313879. doi: 10.1155/2012/313879. Epub 2012 Sep 20. Surgical treatment of ascending aorta and aortic root aneurysms. David TE. Prog Cardiovasc Dis. 2010 Mar-Apr;52(5):438-44. Ascending Aortic Dilatation Associated With Bicuspid Aortic Valve. Tadros TM, Klein MD, Shapira OM. Circulation. 2009;119:880-890. Late results of a valve-preserving operation in patients with aneurysms of the ascending aorta and root. Yacoub MH, Gehle P, Chandrasekaran V, Birks EJ, Child A, Radley-Smith R. J Thorac Cardiovasc Surg. 1998 May;115(5):1080-90. Custom-tailored valved conduit for complex aortic root disease. Krasopoulos G, David TE, Armstrong S. J Thorac Cardiovasc Surg. 2008 Jan;135(1):3-7. Novel measurement of relative aortic size predicts rupture of thoracic aortic aneurysms. Davies RR, Gallo A, Coady MA, Tellides G, Botta DM, Burke B, Coe MP, Kopf GS, Elefteriades JA. Ann Thorac Surg. 2006 Jan;81(1):169-77. Clinical and Pathophysiological Implications of a Bicuspid Aortic Valve.Fedak PW, Verma S, David TE, Leask RL, Weisel RD, Butany J. Circulation. 2002 Aug 20;106(8):900-4.